Encyclopedia of the Lewis and Clark Expedition explores the people, places, ideas, plants, animals, and tools involved in one of America's most important expeditions, on the celebration of its 200th anniversary. On November 30, 1803, France formally transferred 828,000 square miles to the United States in exchange for $15 million. This land, the Louisiana Purchase, doubled the size of the nation. While negotiations for this deal had been going on, Thomas Jefferson had already begun thinking about a transcontinental expedition to explore the lands west of the Mississippi. Besides the commercial and scientific benefits of such an exploration, there was the issue of asserting America’s sovereignty over the new territory. Meriwether Lewis and William Clark were hired to undertake this journey. They kept detailed journals on the flora and fauna they observed, and members of their teamthe Corps of Discovery, as the group is often referred towere also the first non-Indians to make contact with a number of tribes. This indispensable encyclopedia provides a complete reference to this great American expedition, covering all major elements from the preparatory work initiated by President Thomas Jefferson in 1801 to the corps' return from the Pacific Ocean in 1806. Containing a wealth of informative, cross-referenced A-to-Z entries, as well as an extensive chronology with mileage markers, an introductory essay, a strong general bibliography and further reading lists to the specific entries, many maps, and more than 100 black-and-white photographs, Encyclopedia of the Lewis and Clark Expedition details a fascinating and important expedition in American history. "It is comprehensive, well-organized and precise in its style and content." "...'everything you ever needed to know' about the journey of Meriwether Lewis, William Clark, and the Corps of Discovery...The entries are readable and very interesting, leading the reader to browsing...a good addition to the reference section. Be sure to alert all American history teachers to this volume. Recommended." "...this is an excellent resource, clearly organized and well written. Its coverage is extensive...A user can dip into it at any point and begin an education in one of the most intriguing and extraordinary achievements in American history. Recommended for high-school, public, and undergraduate libraries." "The reader who wants to know about virtually everyone and everything associated with Lewis and Clark need go no further than the Encyclopedia of the Lewis and Clark Expedition." "Libraries wishing to satisfy information needs on the subject cannot go wrong by acquiring this comprehensive work...informative, objective, and readable. The 350 entries cover tremendous territory...This is a complete, authoritative overview of a fascinating landmark in American history and will be a first purchase for most libraries." "...overflows with information...engrossing...Recommended for all libraries and schools." "Students researching the Lewis and Clark expedition will find this resource invaluable, as it is replete with detailed information, easy to use, and written in well-organized and clear prose." "...compelling. A chronology with route and contour maps is extremely clear and useful as are additional maps and a list of tribes encountered by the expedition...offers broad...coverage in a style accessible to readers at all levels and provides useful access to more detailed sources. Recommended." "...captures both the intimate details and the larger context of the Lewis and Clark expedition...[its] illustrations, photos, chronology, maps, and bibliography make it essential for all libraries." "...a very good resource for students in history, anthropology and geography, or anyone interested in this watershed in American history, and is a highly recommended acquisition for college and university libraries." 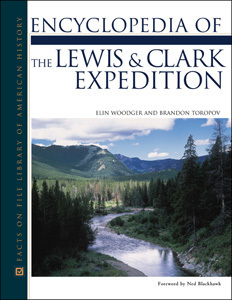 "The Lewis and Clark Expedition is long overdue for its own encyclopedia, and Facts On File has provided a splendid one...reader-friendly...more comprehensive [than the competition] and has much more to say about many subjects...belong[s] on the shelf of any serious student of Lewis and Clark." "...mak[es] it very easy to look up hundreds of details on the expedition, including the events that led to it and the aftermath. Any library with an American history collection will want this book on its shelves. One of the most important parts of this volume is its thorough introduction...[a] superb volume."